Anyone who has volunteered at a GreySave Homecoming day knows that the greys come off the track with all sorts of ugly plaque, tartar or just plain debris on their teeth. It is often sooo bad looking and smelling we just refer to it as “greyhound teeth” on the in-processing notes! 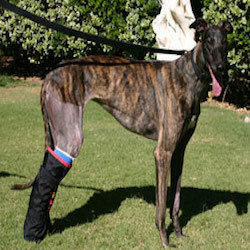 At the track they eat a soft and sticky diet that is particularly bad for dental issues and plaque buildup. Many come in with advanced stages of gingivitis. It seems that the older the greyhound is and the longer they were on the track, the worse condition their teeth and gums are in. However, when our new kids go in for surgery they also get a complete dental cleaning and sometimes that cleaning involves dental extractions. After their 1st good dental cleaning their teeth look so much better and their mouth smells healthy, at least for now. However, dental care cannot stop once their teeth are cleaned and they have been adopted. 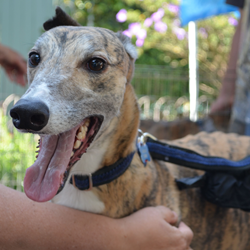 Keeping your greyhounds’ teeth clean and gums healthy is a critical part of caring for your greyhound. How to best care for them and when to remove compromised ones has been subject to a certain degree of opinion and not necessarily hard facts. Over the years, we have asked our veterinarians what they think is the best way to keep the teeth clean and gums healthy and also when it is appropriate to pull out some of the more compromised teeth. We quickly realized that different vets had different ideas concerning which teeth could be saved especially if the roots are already exposed but the tooth is not loose. Part of the answer is to save as many teeth as possible since with fewer teeth, there is less natural cleaning going on since the remaining teeth can’t chew on harder foods, dental treats and they will be back to eating soft sticky foods. In search of clear and concise guidance, we interviewed a Pasadena veterinarian that limits her practice to pet dentistry. 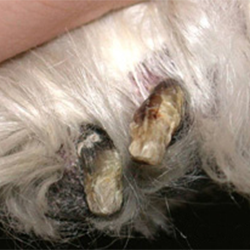 We figured she had seen lots of pet’s teeth both good and bad in the 15 years since she confined her practice to dentistry. After a two-hour visit with Dr. Jennifer Lynn, of Advanced Veterinary Dentistry in Pasadena, we learned a lot about how to minimize the buildup of tartar and plaque and potentially save more teeth by using a few techniques of good home care and regular dental check-ups. She has given us permission to share with our readers her thoughts and the information she provides on her Home Care Sheet. First, a brief tutorial on tartar, plaque and calculus and how the trouble begins. Tooth enamel is smooth, which makes it more difficult for the bacteria in the mouth to organize and develop into plaque and subsequently tartar (calculus). However, if there is any root exposure, or scratches in the enamel, these are the areas that bacteria can “settle”. Bacteria and the saliva, food and fluids found in the mouth can begin to form plaque in as little as four hours after brushing. Certain foods, such as rice, oatmeal or other sugar substances, will stick more. Tartar, also called calculus, is organized plaque that has become mineralized. Wiping, brushing or rinsing disrupts the plaque and helps to prevent it from organizing and mineralizing. This is where home care begins. 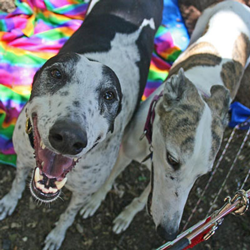 As Dr. Lynn’s Home Care Information Sheet says: “It’s Good to Chew, Better to Rinse and BEST TO BRUSH!” So, let’s take a look at what we can do to minimize the need for invasive dental care by spending just a few minutes a day on our hounds’ home care. We will start with the least time-intensive and work up from there. Plaque reducing diet: If you greyhound’s tummy will allow, there are some special brands of kibble that claim to reduce the plaque and tartar accumulation either via the size of the kibble or enzymes within the diet. But, in general, course and crunchy kibble and snacks work best. Avoid soft or sticky dog food unless your greyhound can’t chew their food. Brushing/wiping: use a soft tooth brush, a rough 2x2 gauze or paper towel to wipe along the gum line to disrupt the biofilm and reduce plaque formation. Some greyhounds are just fine with you using an electric toothbrush. Water additives: an example would be Oratene (by Biotene), which claims to control plaque and tartar just by adding to daily drinking water. Rinsing: a special syringe with a curved tip and warm water can be used along the upper and lower gum lines. C.E.T. Oral Hygiene Rinse contains chlorhexidine and comes with a curved syringe. It can be used daily to help reduce plaque and bacteria and freshen breath. Spraying: Get a small spray bottle from a beauty supply place and fill it with Dentahex Oral Rinse. Spray on their teeth, especially the back teeth, after every meal and after wiping away any excess food. This product also contains chlorhexidine. Products designed to help heal the gums: 1-TDC (1 TetraDeconal Complex): This product has been recommended by one of our local veterinary dentists and can be ordered on line. It can be used for gum and/or joint care. But when the gel-cap is opened and spread across the gums it works on the gums. The manufacturer claims the product operates at a cellular level to heal the gums. Chews: some digestible chews, such as Greenies and C.E.T. Chews Hextra, claim to reduce calculus and contain chlorhexidine that may provide up to 24 hours of antimicrobial action. Additionally these products have a scaling action as they are crewed. Chicken feet – Raw - these can be purchased at some Asian and Mexican grocery stores, either raw or frozen. Your best bet is to defrost a few and give them two a day or maybe a couple with every meal! Chicken feet – Freeze dried - to locate some, just check for dehydrated chicken feet on the Internet. Watch for made in the USA. Raw bones – never cooked as they splinter - Raw feeders have found that raw, meaty bones including duck and turkey necks or frames will also reduce plaque and tartar. If you use raw bones, please watch to see make sure they are a good size to gnaw on but not choke on. Other cautions are that unless your dog is an only-dog they can get very possessive and fights can break out. Plus your dog needs to be monitored closely as some bones are so tough and the dog get so possessed by them that they could break a tooth. 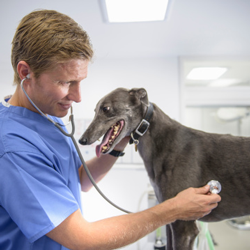 ​Many of you may remember when greyhounds had their preventative teeth cleaning done by specially trained veterinary technicians at some greyhound events. However, a couple years ago the American Veterinary Medical Association (AVMA) in conjunction with California Vet Association issued or maybe just started enforcing a requirement for veterinary supervision of all non-sedated dentals. 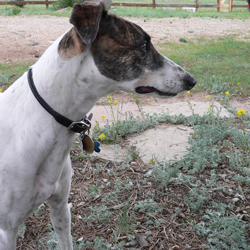 That changed a greyhound adopter’s ability to locate non-sedated preventative dental services at a reasonable price. As a result, greyhounds lost an essential part of their dental wellness routine. Since veterinarians generally only offered sedated dentals that require blood work before the sedation the cost of a dental became a huge issue. In my area, the cost of a sedated dental runs from $600 to $1,000, a cost that is not in everyone’s annual budget. So greyhounds and their teeth became a casualty of that change. But where there is a challenge in a market economy a solution often materializes. Since the regulatory change several things have happened some bad and some good. For bad there are now many greys with very bad mouths and fewer teeth! And as teeth get removed it negatively impacts their ability to eat solid crunchy foods that helped self clean their teeth. 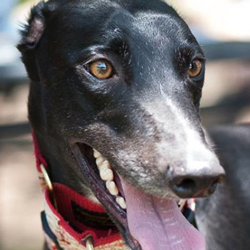 Adopters looked for products to help their greys keep their teeth clean and breath fresher, spending much $. Finally a non-sedated dental industry moved into the void. 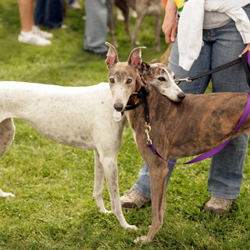 To assist other adopters and our younger greyhounds we started doing some research and discovered that there are generally two non-sedated business models. One is that some veterinarians contracted with a 3rd party dental team to do the non-sedated dentals while they do the pre-dental check up (AKA supervision). This service seems to cost from $180 to $200 per visit. The other is that roving non-sedated dental businesses sprung up generally in pet stores and groomers. They bring their own vet to supervise the technician’s dental service. This service seems to cost from $100 to $160 per visit. In both cases, the results are only as good as the tech’s capabilities to understand and clean “greyhound teeth”. Non-sedated dentals of today should include scaling, using a laser cleaner and polishing as part of the procedure. They should also counsel you about better preventative dental care and send you and your pet to a vet or vet dentist if the teeth need care greater than they can give. 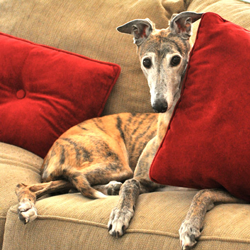 So how do you find a non-sedated location that will work well for you and your your greyhound? 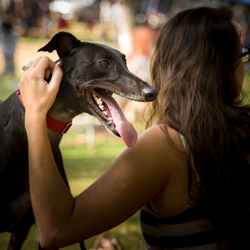 First is to find a location near you, either at the vet’s office or pet store that has extensive experience with greyhounds! If they have that experience they will know that even though greyhounds are big they are pretty sedate even without the sedation. They will also know that the teeth aren’t perfect pearly whites even from the day the dog came off the track. The best way to get non-sedated dental information is to get recommendations from other greyhound adopters. To meet that goal GreySave has started a list, based on adopter’s recommendations. We will try to keep it updated with your comments and recommendations. Please be aware that if your greyhound is not a patient at the particular vet’s practice there is probably an initial and separate vet charge of up to $90 so please ask!! Also many of these practices seem to give a discount based on how often you come in to get their teeth cleaned. So ask about that too.